A by-product from demolition sites, our recycled shingles are both a cost effective and eco-friendly alternative to using newly quarried aggregates. Used in a range of construction projects including drainage applications and sub-bases, we would not recommend recycled shingles and gravels when a decorative finish is required. Our recycled shingles are made from a variety of construction materials, including crushed concrete, crushed brick and reclaimed gravel. Once crushed, these materials are screened to the correct size and the fine content removed. 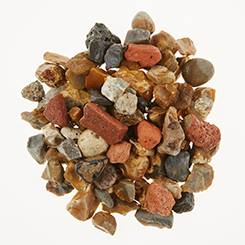 As a result of the diverse materials used, recycled aggregates can be varied in both colour and in texture. Soils and Stone supply 10mm, 20mm and 40mm recycled shingles and gravels which are available nationwide. 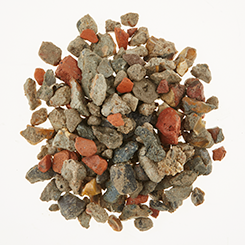 Soils and Stone 10mm recycled shingle/gravel is produced from crushed concrete, crushed brick and a percentage of reclaimed gravel and has an angular finish. Our 10mm is ideal for use as a drainage material and for pipe bedding. 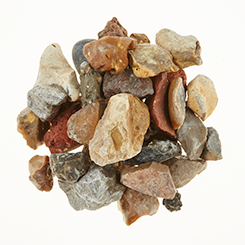 Soils and Stone 20mm recycled shingle/gravel is produced from crushed concrete, crushed brick and a percentage of reclaimed gravel. Angular in nature, 20mm recycled is screened to reduce the dust and fine content. Our 20mm can be used in a variety of projects including a drainage medium such as a soak aways and for use around pipes. Soils and Stone 40mm recycled shingle/gravel is produced from crushed brick, concrete and reclaimed gravel, giving both a variety of colours and textures. During the crushing and screening process our 40mm becomes angular in nature. With minimal dust and fine content this is an ideal drainage material and may also be used as a base material.